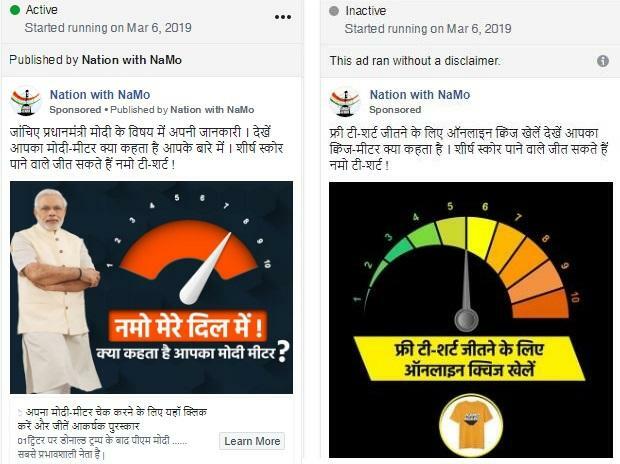 With the 2019 Lok Sabha elections drawing close, it appears that parties and politicians have upped their ad game with pro-government ads leading the race on social media. You can view the complete data here. 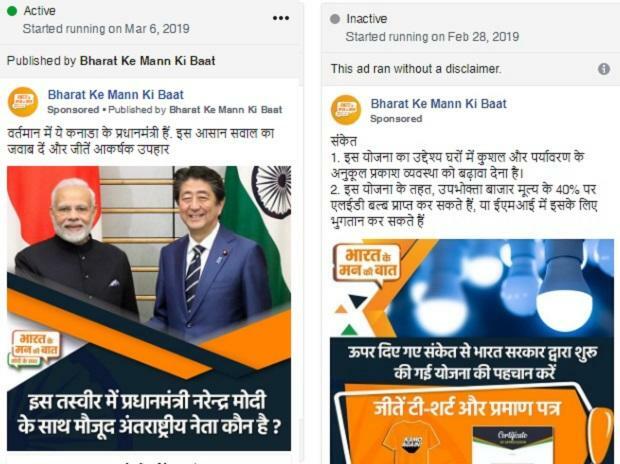 The monthly report (February 1-March 2) put out by Facebook, in its effort to increase transparency, shows that Bharat Ke Mann Ki Baat spent over Rs 1 crore — the highest amount — for running 1,168 advertisements across Facebook/Instagram. Moreover, these ads ran without any disclaimer. According to Facebook, "When an advertiser categorizes their ad as being related to politics or an issue of national importance, they are required to disclose who paid for the ad. If an ad ran without a disclaimer, this field will say, "These ads ran without a disclaimer." This means that after the ad started running, we determined it was related to politics and issues of national importance and required the label. The ad was taken down." The list also shows that the top three advertisers are all pro-government pages, namely — Bharat Ke Mann Ki Baat, Nation with NaMo and MyGov India, the only verified account amongst the top three. 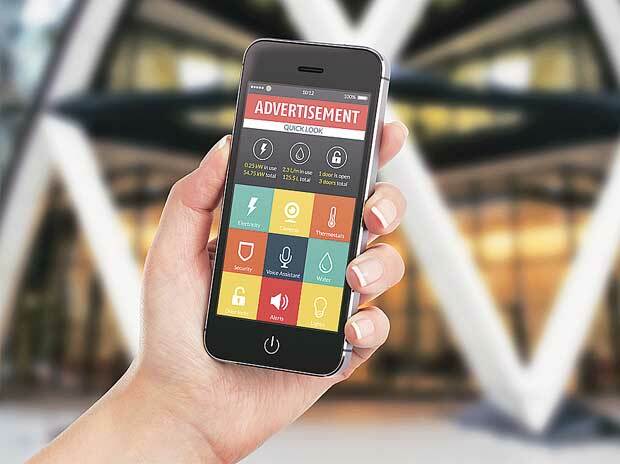 They cumulatively spend over Rs 1.7 crore for promoting 1,913 ads, that too, without running any disclaimer. 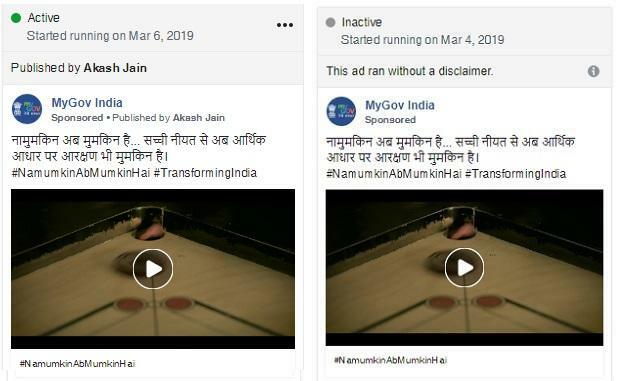 From February 2019 to March 2, 2019, the official page “Bharat Ki Mann Ki Baat” spent over Rs 18 lakh on advertising 338 different ads across Facebook and Instagram. In second place is a page called “Nation with NaMo”, having spent nearly Rs 12 lakh during the same month with 443 ads. In third place is “MyGov India” with Rs 9 lakh being spent on nine ads. However, all three pages also sponsored ads with disclaimers and spent over Rs 39 lakh in 840 ads collectively. Interestingly, MyGov India spent Rs 913,786 in just nine ads in February. Leaving all politicians behind, the official page of Odisha Chief Minister Naveen Patnaik has spent the most — Rs 862,981 — on 32 ads in February. These have been published by Sasmit Patra, Biju Janata Dal Odisha and unknown sources. Following him is BJP chief Amit Shah's official page that spent Rs 212,071 on just one ghost advertisement. The Facebook report also stated that from February 24 to March 2, the top search words searched on Facebook and Instagram were "bjp, modi, congress, narendra modi and India."